Jumbula helped us create the website we wanted to take all registrations for our chess classes. We offer about 105 classes at a time and about 50% register through our site. In addition we register students for chess tournaments and summer camps through the site. They made a very nice looking site and are very responsive to our requests when we need help. Jalal is a very nice person and the support staff have been great. I am not a tech person so don't have the context for this question, really. I help set up classes, put them online, and manage registrations. My reaction is very practical - I just want it to work! Jumbula has provided us with a number of different solutions for our business. Their website/software is easy to use and solves a number of problems for businesses that provide classes, camps and other services to parents and children. It does the job of at least one employee with the click of a few buttons. Customer service has been incredibly responsive. As a parent, I would love it if more businesses used Jumbula - being able to register for multiple classes online, fill out paperwork efficiently, and communicate with teachers and coaches easily makes life so much easier. Easy to use, efficient, simplifies processes. Did you read the part about reducing customer service interactions from 380+ to 1? We've saved so much admin time that we got busy with other thing!Jumbula has completely streamlined and revamped our daycamp registration process. We've gone from 2017, nearly 400 customer service interactions for our daycamps (almost a 1:1 ratio for registrations to interactions, each one anywhere from 15 minutes to over an hour)...to ONE for 2018, and that one mostly involved getting her started by clicking the right link. Super streamlined and intuitive, with a well-thought-out GUI that makes sense to busy parents. Jumbula has completely streamlined and revamped our daycamp registration process. We've gone from 2017, nearly 400 customer service interactions for our daycamps (almost a 1:1 ratio for registrations to interactions, each one anywhere from 15 minutes to over an hour)...to ONE for 2018, and that one mostly involved getting her started by clicking the right link. Super streamlined and intuitive, with a well-thought-out GUI that makes sense to busy parents. Reporting needs some work; it would be nice if all reports lived in the same place. The administrative side of things isn't quite as intuitive as the customer-facing interface, but it's also not bad: reasonably speedy, pretty interface, etc. Responsive design would also be nice, or a mobile admin app for tablets / phones. Jumbula has made our lives much easier during the summer camp registration process. On the back end, there is very little effort once your account is set up. It has provided nearly every feature we wanted in our registration software. It has made the post registration process much easier as well. Running reports has been very helpful as well. We are very happy with our choice to go with Jumbula. 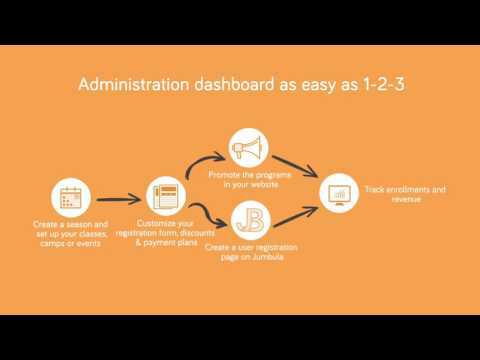 Jumbula has nearly every feature necessary for registration administration. It allows easy tracking of registration transactions and participants. It provides easy reporting. It also provides many custom features to meet the needs of the administration staff. The functionality of the software is near seamless. I will also add that the customer support team has been incredible. They have been very patient with me while learning to use the software and always find a solution to any issue that arises. Q. Does Jumbula offer an API? No, Jumbula does not have an API available.